Following up on my last post on precision in art I realized afterwards that one reason I've been able to do more precise work with insects is that I've caught the insects and then drawn them under a dissecting microscope. The detail I can see is strong AND the insect doesn't move. It is dead. I don't know any bird artists personally. The ones I've read about sometimes work from study skins in museums, or dead birds that they may have happened upon. In that case the bird is also dead and allows more detailed study, though of course it is no longer alive. Still it does allow a more detached scientific study similar to that of an insect under a microscope. My understanding is that this was Audubon's primary method of work, after he'd shot the bird. It is probably the best way to see some details that can only be seen in brief glimpses in the field. On the other hand some bird artists whose work I very much admire work primarily from life, i.e. they only draw and paint what they actually see. They don't use photos. This reminds me of the times I used to draw mayflies. Mayflies live only for a day or so. Moreover everytime I used to catch them they would shrivel up into pale husks of their former beautiful selves. Their beauty was evident only when they were alive. You either had to draw them as they flitted about while alive or draw a shrunken corpse that seemed to have little relation to the live mayfly. Without getting too philosophical about this I do think that it is an apt analogy. More detail can be seen/drawn/painted when a bird or insect is no longer alive and not being such a nuisance moving about at unexpected times. On the other hand the artist always knows the insect or bird might move and he needs to be extra alert to capture what he sees as he sees it. A second later the bird may have moved. I think that this relates to why I prefer works done from life. The drawing at top is a portion of a larger drawing. It shows a Robber Fly drawn while viewed under a microscope. 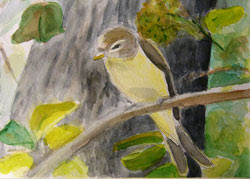 The watercolor is based on a photo taken of a Warbling Vireo at the John Heinz Wildlife Refuge(Tinicum) in Philadelphia on Memorial Day weekend, 2008. As I mentioned last time I'm always more interested in creating a work of art when using birds as subjects than I am when drawing insects. That may be related to the fact that I can never see them with the same detail that I see insects. On the other hand it may also be that the lack of precision tells me that the drawing/painting lacks something. Maybe I can rescue it with 'art'. I got back my many bird photos from May trips to Illinois and Shenandoah National Park last week. Included in them were many photos of some very friendly Palm Warblers at Oakdale Nature Preserve in Freeport, IL. Part of their cooperativeness I'm sure is related to the fact that they spend much of their time close to the ground, rather than at the top of very tall oaks like many warblers. 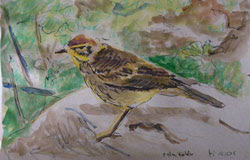 The image above is a small colored pen and ink drawing with watercolor wash. It's based on one of the photos. Though this Palm Warbler was close enough that the photo shows a lot of detail, particularly of feathers, I opted not to include that much detail. The same is also true of the background foliage but I usually don't have much interest in foliage detail. The warbler itself was another story. There was a temptation to include more detail, assuming that I could also do so successfully. But, at least for me, that would require a finickiness that I thought would kill the overall life of the painting. This is probably due to both my artistic history and actual physical habit. I probably couldn't control the watercolor brush well enough to show all the details in the feathers even if I wanted to. But my artistic background, which says that no one part of the painting is ever as important as the whole painting, probably had a much larger affect. 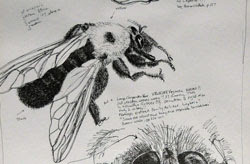 My insect drawings are far more detailed. But in a way they are more studies, whose secondary intent was art. In my bird art, it is art itself that always takes precedence, with the secondary intent being accurate detail. Perhaps as I continue to do bird art that will change. But I doubt it. More likely art will remain the primary intent, but on a more ambitious scale than many of the small sketches that I've shown here.